I am in luuuuuuuuuuuuuuuuuuuuuuuuuuuuuve I tell ya. What a beautiful effect! A friend of mine knit me a beautiful beaded necklace and I love it. So I decided that this kind of necklace would be perfect teacher and mother gifts for Christmas. This is my first one, modeled by KJ9. 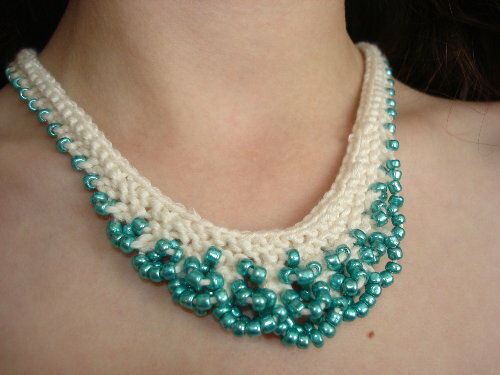 The pattern is the Scallop Edge Beaded Necklace from the 101 Designer One-Skein Wonder Book. It’s knit on Patons Serenity DK Bamboo & Cotton. and size 6 glass seed beads. Took about an hour to string the beads (because needle plus yarn makes it hard to add beads) and maybe 45 minutes to knit. I used a toggle for the clasp, which you can see in the last picture. I also crocheted five chain stitches at each end when I added the toggle, just to add a little more length, making the toggle easier to work. Simple, yet a very satisfying quick knit. 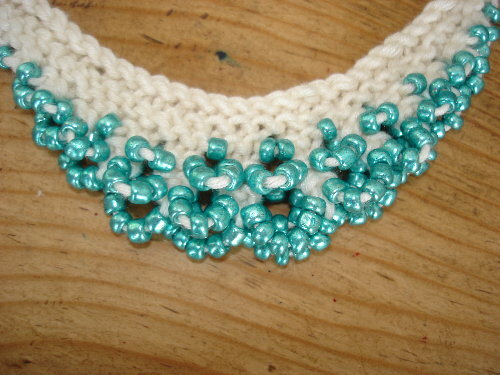 That looks like a great first project to try beaded knitting eh? Fantastic. oh my gosh that is beautiful!!!!! VERY lucky ladies who will be recieving those!!! Well done they are very lovely. drrrrrrrrooooooooooooooollllllllllll that is soooooooooooo cool!!!! After seeing your knitted necklaces, I bought the book the pattern is in. 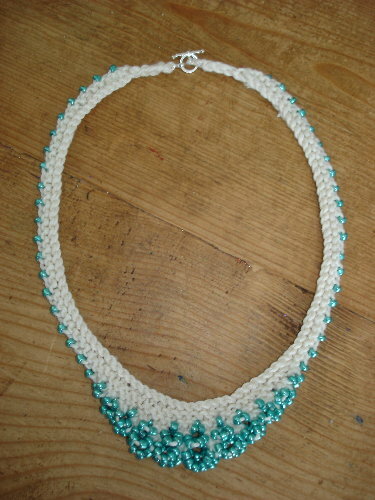 I have knitted 3 necklaces and they are all longer on one side than the other. Have been very careful to knit just like pattern calls for. Do you have any ideas on what could be wrong? What to do with leftover Sock Yarn?